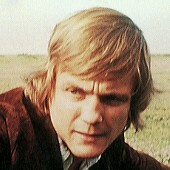 Born in Cornwall in 1942 Michael Craze started acting, at the age of 12, in Boy Scout gang shows as it was found that he had an excellent young soprano voice. This led him to being cast in West End productions of The King and I and Damn Yankees After performing in repertory theatre he turned to television appearing in various programmes which included Armchair Theatre in 1958, Target Luna in 1960, Z Cars, and Crossroads. During the seventies and eighties he managed a number of public houses. He still took on the occasional small acting part for both films and television. This included the 1994 Kenneth Branagh's film Frankenstein. Unfortunately Michael Craze collapsed and died on 7th December 1998 at the age of 56. Ben Jackson was a merchant seaman who, while on shore leave from his ship The Teazer, became a regular visitor at the Inferno night club in London. It is there that he comes to the defence and befriends Polly, a secretary of scientist Professor Brett. It is also here that he also meets Dodo who is visiting the club while The Doctor is investigating Brett's futuristic computer called WOTAN. After helping The Doctor defeat WOTAN - Polly and Dodo having fallen under the machine’s influence during the fight -, Ben and the now-restored Polly meet The Doctor outside the TARDIS to tell him that Dodo has decided to stay behind and to return her TARDIS key. As The Doctor goes inside the TARDIS they suddenly realise they still have Dodo's key and enter the police box to return it. The TARDIS then dematerialises taking them with it to become The Doctor's new companions ("The War Machines"). Although The Doctor was initially not expecting to have new companions so soon after Dodo’s departure, he nevertheless seemed to get along with his two new friends fairly quickly, privately admitting to himself that he hadn’t been looking forward to being on his own once more. While Ben acknowledged that he knew relatively little about The Doctor, he concluded early on in his travels with The Doctor that he knew that The Doctor’s life was an adventurous one that he wanted to share with his friends, and felt at the time that he didn’t need to know anything else. However, after only a short time with The Doctor, Ben and Polly became increasingly concerned for The Doctor's health, due to the cold environment of the South Pole that the TARDIS had taken them to. During their subsequent confrontation with the Cybermen as Earth’s long-lost twin planet Mondas returned to the solar system, The Doctor became increasingly weaker as the crisis progressed, and at the very end of the story they returned to the TARDIS to find that The Doctor had collapsed and was lying on the console room floor. Powerless to help, they then both then witnessed The Doctor regenerate into a much younger and darker haired man ("The Tenth Planet"), the following story featuring them trying to work out if the man before them was genuinely The Doctor. Even after the initial confusion of working out just what The Doctor had undergone before their very eyes, Ben continued to challenge The Doctor, noting that he no longer even acted like the man he’d been before, although he was finally convinced that 'the stranger' was indeed The Doctor when a Dalek recognised him for who he is, Ben concluding that he could accept The Doctor as the real thing if a Dalek could ("The Power of the Daleks"). Despite this, it took Ben briefly being connected to The Doctor’s mind when they were forced to form a telepathic gestalt to contain a shadow creature to fully convince him that the new Doctor was the same man as the old one ("Short Trips: Solar System - Pluto"), and even then he still regarded The Doctor with suspicion, once expressing doubt that the new Doctor was all there sometimes ("The Murder Game"). Right from the start, when the audience was first introduced to Ben at the Inferno night club, it was clear that he saw himself as a knight in shining armour and during the time he spent aboard the TARDIS he protected Polly from the many dangers they found themselves in. He even resorted to physical contact to carry out this role as demonstrated at the night club when he tackles the unwanted amorous intentions of a young man who was pestering Polly. His courage was further demonstrated in his time with The Doctor, such as when he fought the ruthless smugglers he faced in his first trip in the TARDIS ("The Smugglers"), shooting at a ruthless Hunter-Killer robot when they arrived in the middle of a military training exercise on an asteroid in the far future ("Ten Little Aliens"), and even taking a great deal of independent action when facing the Cybermen, ranging from destroying the Cyberman guarding him to working out the Cybermens’ weakness to radiation ("The Tenth Planet"). However, despite this Ben was quite shy; in his initial meeting with Polly, it took his confrontation with her harasser to break the ice and prompt him to agree to see Polly again, and when participating in a role-playing game in the future he felt that he was acting above himself when he simply dressed in an admiral’s uniform for the game ("The Murder Game"). He settled into the concept of time travel quite quickly and his nautical training meant that he got on well with the First Doctor, eventually growing to accept the Second Doctor as they worked together during such problems as trying to save Polly from the Selyoid influence ("Dying in the Sun"). Regardless of any post-regenerative tension that existed, Ben was soon established as a loyal and reliable companion to The Doctor, a team feeling eventually emerging in the ship, especially after Jamie joined them. (Although Ben and Polly sometimes teased Jamie about his comparative lack of historical knowledge compared to their own). A particular example of their group dynamic occurred during the Cyberman invasion of the Moonbase ("The Moonbase"), with Polly developing a chemical solvent that could be used to destroy the Cybermens’ respiratory systems - which Ben teasingly called ‘Cocktail Polly’ - while Ben subsequently came up with the plan of using it against the Cybermen by putting it inside the base’s fire extinguishers. Possessing a long interest in the navy - his fascination with the sea having begun when he sneaked on board his father’s boat when he was fourteen ("Invasion of the Cat-People") -, Ben's nautical training was at times a big help in his adventures in the TARDIS like in "The Highlanders" where he suffered a nasty keel-hauling, although on another occasion he was briefly press-ganged onto a ship during a visit to 1648, forcing him to work with an enemy of his ‘captain’ in order to escape the ship and return to London and his friends ("The Roundheads"). He was full of energy and vigour and was used to obeying orders from those that he saw as his superiors, although he was still prepared to take independent action when he had to, such as when he rescued Polly from WOTAN before The Doctor’s reprogrammed War Machine destroyed it despite the warnings from his allies ("The War Machines"). He was very practical, dependable, faithful and unafraid to involve himself in all the action, especially if it meant protecting Polly. He liked to impress Polly with his ability to cope calmly and to show his milder side when required, demonstrating a tough and resourceful nature when it was required of him, and despite Polly making fun of his Cockney accent they made a very effective team and got on well together. After the encounter with The Chameleons, who have tried to invade Earth, it is discovered that they are back near London on exactly the same day as when they left in the TARDIS. Realising that this was the best time for him and Polly to leave The Doctor and stay on Earth, the two parted ways with their fellow companions ("The Faceless Ones"). Although Ben and Polly subsequently went their separate ways and married other people, the two spent the day together when Mondas came to Earth in their lifetimes, waiting out the experience as their past selves dealt with the crisis ("Short Trips - Mondas Passing"). The two were reunited with The Doctor again at the turn of the Millennium when Polly, now the head of the GEZ record company, collapsed at the funeral of a reality TV-show host and was attacked by an unidentified hostile force that sent her to different locations in history to disrupt the timeline, her travels helping Polly realise the mistakes she’d made in her past before the Second Doctor and Jamie brought Ben to her unconscious body in the present. With Ben having brought her back with the kiss of life, he and Polly finally admitted their love for each other, spending New Year’s Day with their old friends as they began their new lives ("Short Trips: Past Tense - That Time I Nearly Destroyed the World While Looking For a Dress"). Shortly after joining the TARDIS, Polly and Ben became increasingly concerned for The Doctor's health as he starts to show signs of fatigue. When they return to the TARDIS they find that The Doctor has collapsed and is lying on the console room floor. Powerless to help they both then witness the regeneration of The Doctor into a much younger and dark haired man. Polly at first is happy to accept that this stranger is The Doctor but, with Ben convinced that he is an impostor, they are both left uncertain as to the true identity of the younger man now before them. It is only though when a Dalek recognises The Doctor that Ben truly realises this stranger really is The Doctor ("The Power of the Daleks").